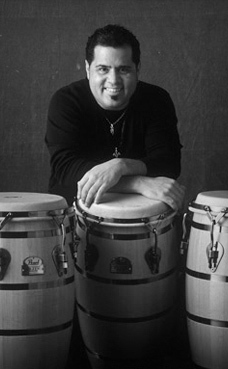 Michito Sanchez is a world-class percussionist and is featured on Stylus RMX. As a first generation born American of Cuban parentage, bongos were a constant fixture in the Sanchez household and between those and the pots and pans, the youngster was able to cut his early musical teeth. Sanchez has a sterling reputation that has offered an endless list of sessions, videos and live performances in every genre of music - including artists such as: Tito Puente, T-Bone Burnett, Joe Zawinul, Elvis Costello, Crosby, Stills & Nash, Elton John, the Rolling Stones, Don Was, Bruce Hornsby, Robert Palmer, Herbie Hancock, Placido Domingo, Luis Miguel, Glenn Frey, Claire Fischer, Rudy Regalado & Chevere, The L.A. Salsa Society Orchestra, Bongologic, Cecilia Noel & the Wild Clams, John Denver, Kenny Loggins, Boz Scaggs, Joe Sample, Herb Alpert, Hanson, Chucho Valdez, Toni Braxton, Steve Winwood, Raul Malo, Boney James, Flora Purim, Fernando Ortega, Nelly Furtado, Juanes, Brooks & Dunn, Iekichi Yazawa, Airto Moreira, Giovanni Hildalgo, Eric Benet, Angelique Kidjo, Bill Cantos & Mary Falcone, Doc Sevrinsen, Nestor Torres, Rick Trevino, David Garfield, Jose Rizo's Jazz on the Latin Side All Stars and several contemporary christian artist including Darlene Zschech, Tom Brooks, Lenny Leblanc, Tommy Coomes, Franklin Graham Praise Band, Andre Crouch, and of course Tommy Walker of his home church, Christian Assembly in Eagle Rock, CA. His plate is full, but he never complains about too much work -- it's what makes him tick. "Every call to play -- from club dates to recording sessions -- is a unique experience and a blessing, one I look forward to," says Michito, "As long as I am playing music, I am happy."